Thread: 6 button reverse engineering? after the backlighted vmu i'm thinking about making DC's controller more functional(i'm considering motion sensing too!). so i would like to put in there a female mini din 9 (like the MD2/32x one or similar) and then make a "9-din to Db9 connector" cord. so i could plug a MD controller into the adaptor cord and plug it to the controller, so i don't have to mod it. I used to put those teeny tiny black rubber bands around my analogue sticks, made them feel 10000x better. hell yes, it looks harder than i tought. I hope to figure it out! it's design is identical the original and had built in rumble, i want to use his board and put it in an original one. DC has the best analog so far, nice, responsive and stiff enough (my main gripe with others is that they're too loose...). did you already figured out a complete encoder with both? about the cpld i guess i can't put it on a perfboard put it would need to be soldered on a printed pcb.. (and most important, tools and knowledge to program it! ), logic chips sounds much easier to do, but i guess the complete board would be really big and could not fit inside the dc controller, isn't it? I never finished my encoder, I got quite far with it but I did not work out the final part of it which dealt with timeout condition. 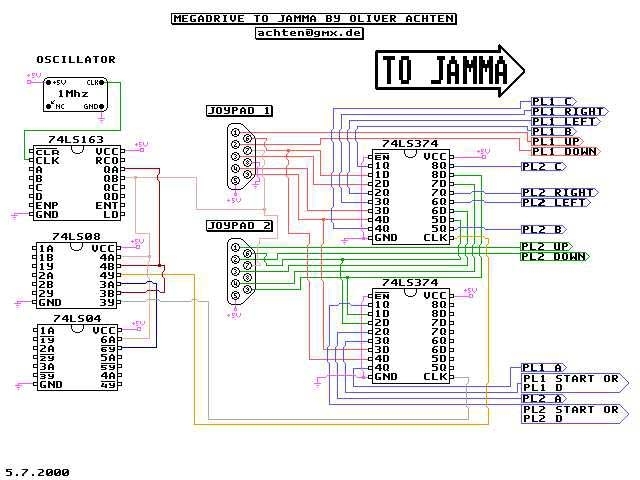 If you use a PIC chip, you can just use programming to read 6 button pads instead of hardware... much easier. If you look at the source for Wolf32X, I have the six button and mouse reading routines commented rather well. It's 68000 code, but it could easily be turned into PIC code. P.S. : For some reason I can't create new topics, so I couldn't announce this encoder. Sorry for resurrecting this old thread. Thanks for bumping this, this is really interesting stuff. I wish I knew about it back when I was developing my Uni-Gen-- would have saved me some work! One of the reasons I like to use off-the-shelf logic instead of CPLDs is because of how fast they go obsolete. It really is a bummer.